For social scientists, portraying society as an almost infinite set of problems is thought to both meet methodological ideals and satisfy considerations of social legitimacy. On the one hand, social scientists divide society into a hierarchical set of problems and their related questions in order to facilitate the process of investigation. On the other, approaching society through social problems and connecting it to potentially high-profile issues enhances the perceived legitimacy of social research. But, beyond considerations of methodology and the social legitimacy of research, the link between social science and problems has a number of additional dimensions. 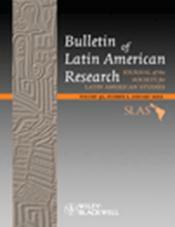 This article considers contemporary problematisation of Mexican society as it is practised by sociologists. My study focuses on continuities and discontinuities in discursive strategies dealing with social problems, based on a systematic exploration of a corpus of articles from three major Mexican sociological journals published between 1987 and 2006. Social problems are a key focal point for methodological, ethical and epistemological perspectives on worldviews, as well as their associated debates and conflicts. As sociological literature finds its place in public debates, policy-making, and the general landscape of a society, an analysis of the portrayal of problems is an attempt to better understand how we, as sociologists, make choices about the social problems that merit detailed examination. These analyses are also attempts to critically assess how we suggest and justify social change.